So far, there is no possibly worldly explanation for the appearance of this figure. Those of you who think you have ready explanations are clearly, obviously misunderstanding what the phrase “no possible explanation” means. 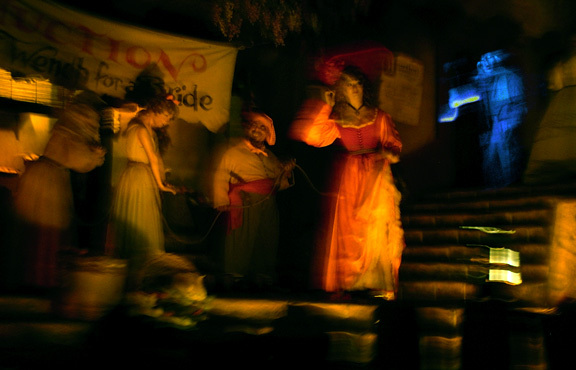 Certainly this puts to rest any doubts about whether or not Disneyland’s Pirates of the Caribbean attraction is haunted. But why is it haunted? Are the spirits of the copious workers killed during its construction angered by the insertion of Pirate-movie characters into their previously relatively non-commercial realm? Do they return from the realm of death to torture those who take flash pictures? Or does this lonely phantom simply “wants the redhead”? Who knows????? Later this year, a new attraction in Epcot’s Innoventions will show guests exactly how it would feel to survive a devastating hurricane. When “Hurricane Goofy” strikes, guests will be subjected chest-crushing winds, rain that feels like bullets, and debris screaming through the air fast enough to be driven through the trunk of a tree. At one point, the hurricane will strike a junk yard and guests will see a Boeing 747 spontaneously assembled by the unpredictable winds. Young children (and any guests weighing less than 250 pounds) will be lashed in place to avoid being uncomfortably thrown about the room (which, during play testing, was found to be unnervingly disorienting). It is expected that this attraction will be most popular with guests who are not from coastal Florida. Should a real hurricane hit Walt Disney World during operating hours, performances of this attraction will be held outdoors. The cave is technically off limits, but to the adventurous Disney fan it is quite a treasure trove! Before she were ejected from the park and charged with felony trespassing, our Official DisneyLies Photo Correspondent saw a Rocket Rod, quite a few freshly removed “it’s a small world” figures, and two thirds of Abe Lincoln. It has been announced that, due to sluggish toy sales and lack of overwhelming interest, Disney will not be making films of the entire Chronicles of Narnia series as originally planned. Instead, the third film — Voyage of the Silver Horse and His Last Nephew’s Battle — will be the last in the series. The rumor mill* tells us that California Adventure’s fabulous Orange Stinger attraction — the most beloved fruit-themed attraction in that entire area of the park — is going to be completely rethemed during an upcoming refurbishment. The attraction will become the Silly Symphonies Swings, themed to the Mickey Mouse short subject “The Band Concert”. In keeping with the theme, the attraction will be entirely wind powered, its theme music will be a duet of “The Storm” and “Turkey in the Straw,” and this will be the first DCA attraction built entirely in TechnicolorTM. Indiana Jones Adventure Map: Guests will be able to buy a map that shows in great detail every nook and cranny of Adventureland — from the nearest bathroom to the farthest branch of Tarzan’s Tree House. No more getting lost in this expansive themed area! Adventure Photo Location: Ever want to have a cast member in a neat hat take your picture so that you didn’t have to hold your own camera? Now you can! Indiana Jones Adventure Queue: The Indy ride’s queue will be “plussed” with extra dust, muskier darkness, more guests, and more of that great “lived in” feeling that everyone enjoys. Also, the safety spiel video will be replaced with the original Raiders of the Lost Ark. Indiana Jones in Adventureland: Indiana Jones himself will appear in Adventureland and do battle with an evil guy! The battle will include rooftop action, whip fights, acrobatics, and carefully orchestrated fisticuffs, ranging all over Adventureland (except during times of high crowds, during which Indy will just shoot the guy). Animatronic Indy: Indiana Jones figures will be added to Pirates of the Caribbean, and rumor has it that young Indiana Jones will appear in a certain “small” attraction after its extensive refurb ends. And more: Later in the year, watch for the opening of Indiana Jones’ Secret Base at Pirate’s Lair on Tom Sawyer Island! The data has just finished being crunched, and last week was officially Disneyland’s least busy week since Cynthia Harris was doused with a bucket of water and melted away. 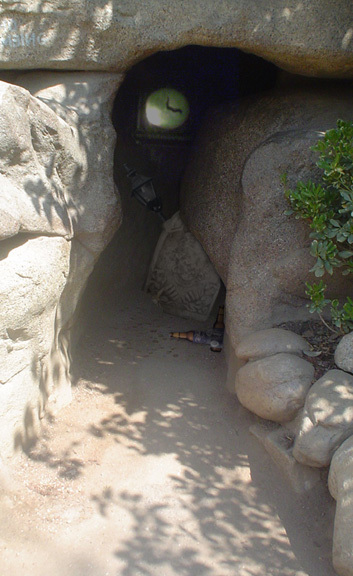 Our Official Disney Lies Photo Correspondent has spotted yet another Hidden Lincoln at Disneyland! This one is in the Jungle Cruise attraction. 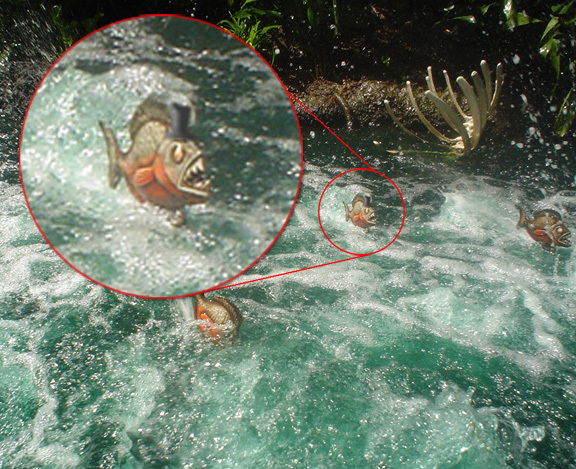 Near the end of the ride, you can just make out one fish that is dressed like Honest Abe? Remember, if you see a Hidden Lincoln at Disneyland, send us a photo!